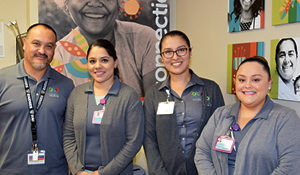 OLE Health’s staff includes (left to right) Demetrio Rubio, Lizbeth Corona, Ambar Woods and Maria Teresa Morales. Since NorthBay Healthcare and OLE Health launched a rare partnership in November 2018, there’s been help for a steady stream of some of Solano County’s most vulnerable patients. “It’s been phenomenal to see the rapid growth and overall community satisfaction. I attribute the overwhelming success of this partnership to the fact that it addresses the ‘triple aim’ of health care: improved patient experience, improved community health and reducing overall cost of care,” reported Wayne Gietz, vice president of outpatient operations, whose brainchild it was to bring together two health systems. The 2,000-square-foot health center ensures those with low or modest incomes and those without an employer health plan have access. OLE Health’s integrated model of care which puts the patient at the center of their own healthcare team is complemented by NorthBay Healthcare’s wide-ranging advanced medical services. The venture, a 30-hour part-time facility with a modest clinical staff, is poised to grow. One registered nurse and a care coordinator already were added. Recruitment of an additional provider is under way to expand from 30 to 40 hours of operation per week.